Welcome to Boston Game Used, a website dedicated to a collection of Boston Red Sox game used baseball bats and catchers equipment over 25 years in the making. The collection includes bats from more than 520 different position players, as well as a growing collection of catchers gear. This journey would not be possible without the generosity of players and their families, the Red Sox, and many, many, many fellow collectors. We currently need 1 bat (the elusive Ken Poulsen) to complete our collection of a bat from every position player who played for the Red Sox from 1960 to the present. Boston Game Used is not a business and it does not deal in game used memorabilia. 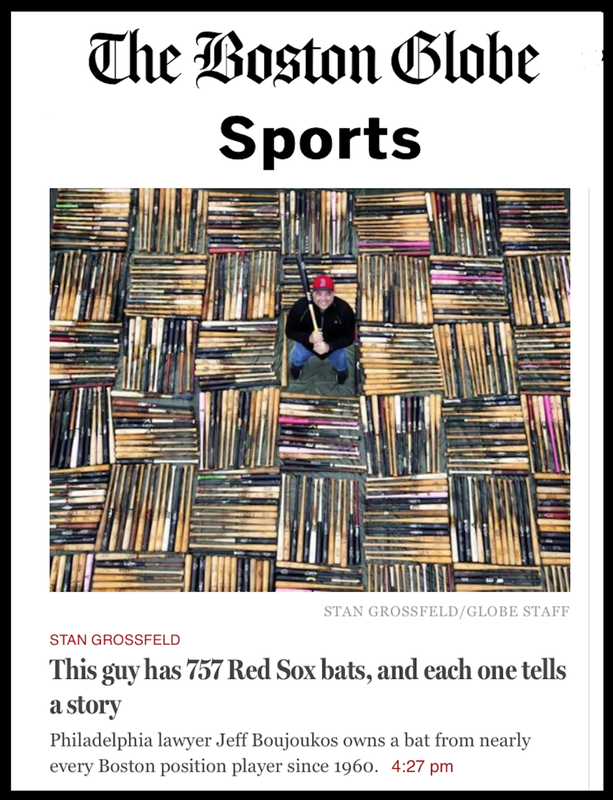 Our primary goals are to build a comprehensive collection of Red Sox game used bats, preserve baseball and Red Sox history, publicly exhibit the collection for others to enjoy, and support charitable causes. In that regard, read about our display of artifacts at Fenway Park in support of the Fenway Park Living Museum Fund in the CHARITY section as well as our support of the Red Sox Foundation among other charities. Photographs of the bats can be found in the BAT COLLECTION section organized alphabetically as well as by World Series Year and we encourage you to continue to check back through the site periodically. We continually add new bats as well as gear to the CATCHERS section and we hope you find it educational and entertaining. If you have an individual bat or collection that you may want to sell, please visit the BUYING section. Hey, we also BLOG about our collection and some thoughts about collecting in general. We recently presented about “Collecting Red Sox History” at the historic Library of Congress in Washington D.C., read about it HERE. Read about the collection in this Boston Globe article.